Cruisin AUTOMOTIVE is the only authorised W.A. dealer. The Custom Autosound USA-740 offers the same classic look that Custom Autosound has always been known for with today’s latest features. Now, with built-in Bluetooth (microphone included), answer calls and get Bluetooth streaming music from your Bluetooth capable phone or Bluetooth compatible device. A solid 300-watt peak power should be all the juice you need, yet the USA-740 has Hi 4volt, 4channel RCA Pre-outs and a Subwoofer RCA pre-out for additional amplifiers. The USB input allows you to plug in a USB flash drive (thumb drive) for playback of MP3/WMA/FLAC/WAV song files. A front mini jack auxiliary audio input and a rear RCA auxiliary audio input provide versatility for options like satellite radio, I-pod or any portable player you wish to use. Match the dominant color of your instrument cluster with user selectable multiple LCD color choices with LCD dimmer control. The AM/FM RDS tuner shows station, song and artist on the LCD display. For those of us committed to music collections on compact disc, the USA-740 fully controls our optional CD-1 CD player. Classic style with today’s sound and performance taking every road and curve with you in your vintage vehicle. 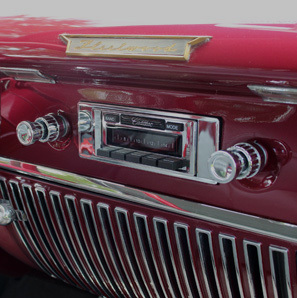 Custom Autosound’s USA-230 is an excellent choice for classic car or truck enthusiasts looking for a more affordable radio without sacrificing quality electronics and a classic stereo look. It has been designed to fit in the stock dash without any modifications required. The USA-230 has the same appearance and all of the features offered in our USA-630 model simply without USB port, iPod dock and CD changer control. The USA-230 does provide an auxiliary input which can connect to iPods, iPhones, satellite radio tuners or any other device with a headphone jack. It also boasts 4 Channel RCA pre-outs and a digital display with electronic tuner, 16 station pre-sets and a 4-way fader. The Custom Autosound SST is a 200 Watt AM/FM CD controller with USB MP3/WMA Flash Drive, IPod control, CD control and Satellite Radio Control; Featuring “RF” (radio frequency) remote control, ideal for Street Rods and Classics. 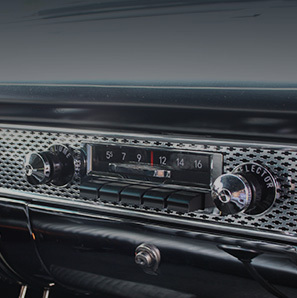 The SST hideaway radio is designed to provide a classic car or truck with exceptional audio quality while leaving the dash and original radio visible in the dash. The SST receiver / amplifier unit is usually hidden underneath the driver’s seat or behind the dashboard and integrates with the vehicle’s speaker system; if the speakers are for a mono radio they should be replaced with Custom Autosound DVC speakers or DUAL speakers. The SST has built in Bluetooth which allows you to stream music from your compatible device. The SST comes with a 10 foot cable connected to a small Bluetooth digital display that mounts flush to the dash or with a bracket, which is included for mounting options. It is controlled by a wireless remote from up to 30 feet away.